My food bowl is almost empty, my food bowl is almost empty!!!!! At the Longcroft Luxury Cat Motel in England, they have a fine dining restaurant for us finicky felines. They serve Salmon, Fresh Cod Steak, and Simply King Prawns, just to name a few of their menu items. They also have a Sunday Brunch that includes ham, free-range chicken and shrimp. While I must travel to Britain just to stay at this wondrous hotel, fine dining for cats isn’t left to just vacation time anymore. There’s a new trend out there to buy and feed cats (and dogs) gourmet meals. People all over the country are seeking out better foods for their pets, such as organic, all-natural, made in the US, and human-grade foods (and what do you mean you haven’t been feeding us human-grade foods this whole time). Humans will pay big bucks for these types of foods, as well, even while those same humans will resort to eating take-out, fast food, or pizza … again! Add to that, that even us finicky cats – and yes, we are very finicky eaters, so keep on buying us that expensive food – even have our own restaurants that cater just to us (out with those human-only restaurants, in with the cat-only restaurants). 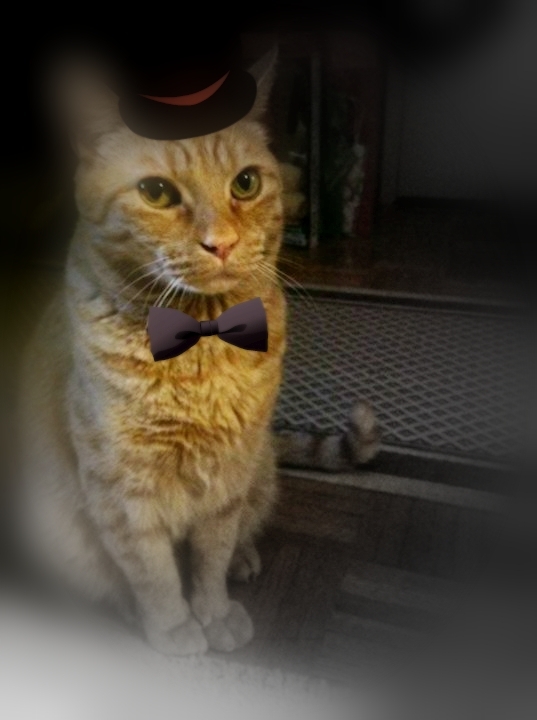 One of the cat-only restaurants is called Duncan’s Fine Dining where they serve items such as Toona Tortellini, Fresh Nip Salad, and Pouncie Bread Man. 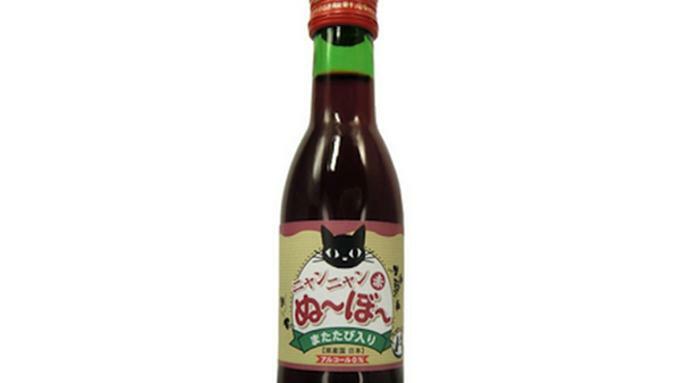 You can even top it off with a fine wine such as the ’95 Chateau Domainecoon Majeur. Furthermore, there are even celebrity chefs cooking for cats now, such as the famous Simon Rimmer. He’s a wonderful guy, working with top-notch veterinarians to cook up some fancy food that’s not only super tasty, but good for our sensitive digestive systems. As a bonus, I’ve included the video below where you can watch the wonderful Mr. Simon Rimmer cook up a tasty, gourmet dinner for cats. So please watch, enjoy, and cook on, humans. Cook on! We love this shirt. Sleek, colorful and fashionably fitted, it can look good on a number of different body types or in any type of laundry basket (our favorite place for shirts are those laundry baskets that have just been loaded up from a nice, warm dryer). 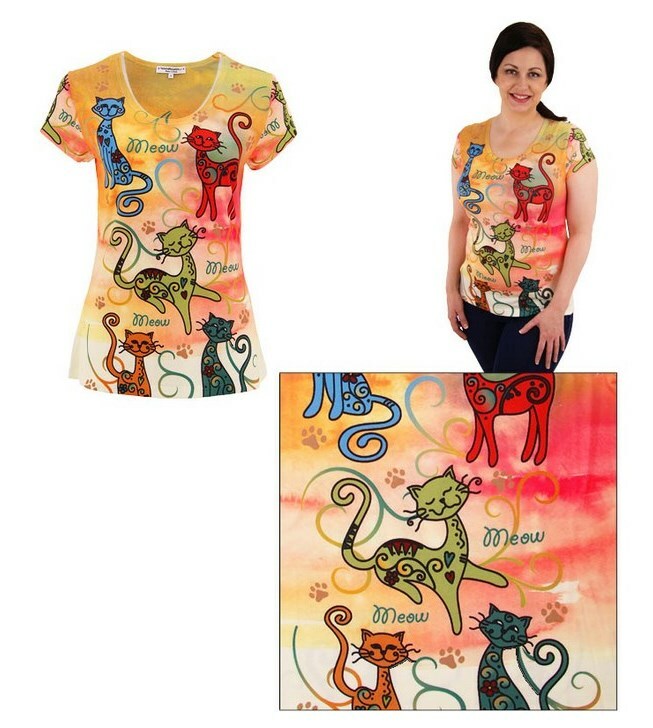 This top is called the Festival Cats Top and can be found on the Animal Rescue site for the low price of $28.95. Us cats will enjoy seeing you humans in this shirt as much as you’ll enjoy wearing it. Check this out! Cats can help heal humans. 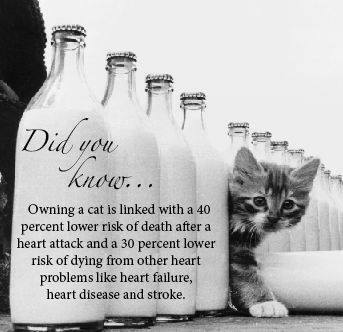 While that comes as no surprise to us kitties, you humans may not know all of this. So, as the flu season winds down, remember to keep us kitties nearby to help keep you healthy and happy! It’s snowy out there … at least in some parts of the country (ok, maybe all parts of the country except California). So let this comic warm you up. We’re excited for February 2nd. It’s going to be a big game out there. 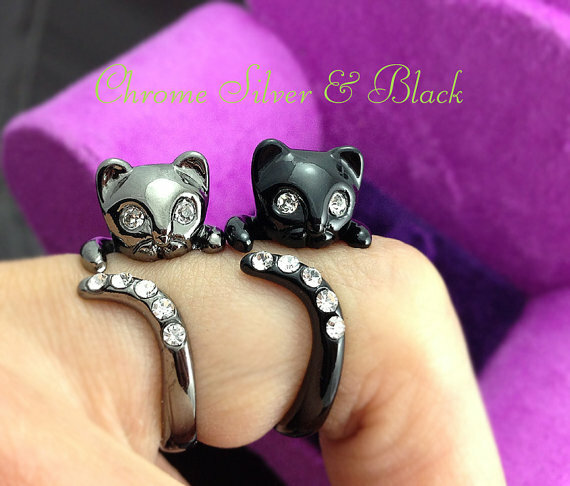 We’re pulling for our favorite team to win – The Great and Mighty Kittens!!!! Yay. Who’s going to help me root them on?? Everyone??? Ok!!! Game night, big party at my house. Don’t forget to bring your own catnip, milk and tuna. If you bring extra for me and the boys, we’ll give you a front row seat during game time! I used to live in a studio apartment in Alameda, Ca. It was on the top floor of a secure, 3-story building that had been built in the 1920s. It was a fabulous apartment, mostly because I knew how to get the door open as long as it wasn’t locked. Eventually, I even figured out how to undo the lock, so mom started using the chain when she was home, always worrying that I’d still be able to get the door open enough to squeak out. 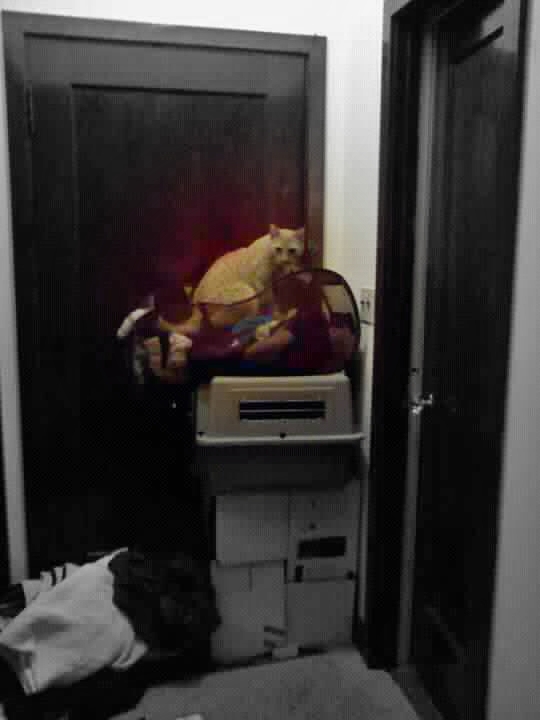 So, she started placing piles of stuff in front of the door, thinking I’d never be able to get the door open. And it worked. But when she was gone, at work, I’d still work at getting that door open. One day, mom came home to find the door ajar, thinking that somehow, someone had gotten into the building and broken into the apartment. When I came running up the stairs after her to welcome her home, she frowned at me, but was whole-heartedly relieved to know we hadn’t actually been robbed. And then told me that under no circumstance was I supposed to open the door for strangers. So when she locked herself out of the building a month later, I refused to let her in, telling her there was no way I could have known it was her. Payback’s an empty food bowl, mom! Thank you for reading! Have a good night! Today’s News Stories brought to you by Channel Todd News and the Channel Todd News Team. State of Emergency: The door is closing, the door is closing! Somebody, open it quick! I’ve lost my opposable thumbs and can’t get out! 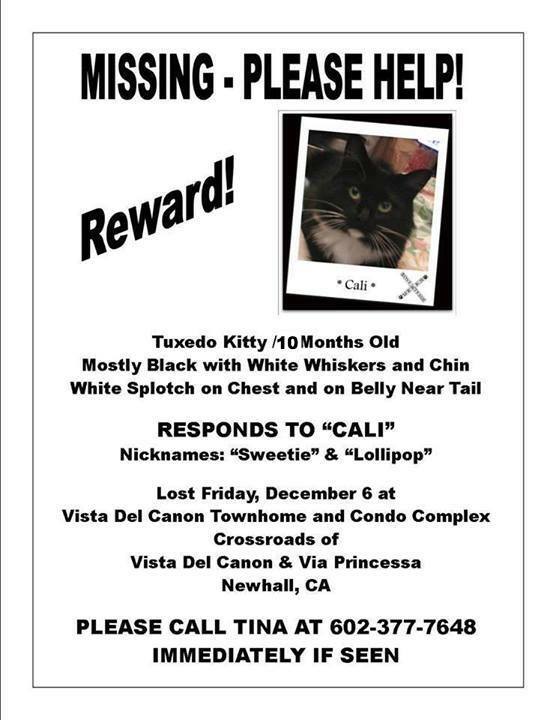 There’s a kitty still missing in Canyon Country, CA (if you know where that is, keep an eye out for this beauty!). She’s been missing since 12/12/13. If you live in the area and see this tuxedo girl, please contact us here at Channel Todd News (either by commenting on this newsfeed, messaging me on facebook, or emailing me at toddfrumpus at yahoo dot com). Or you can go to the Rally for Cali facebook page for direct contact information. Sammey’s Cat Houses is an up-and-coming business that builds hand-crafted cat homes, like log cabins, all for the pleasure of us cats. They were even in a contest that would have given them a commercial spot during the Super Bowl this year. Unfortunately, they didn’t make it into the top 4 and, therefore, won’t be seen during Super Bowl Sunday. 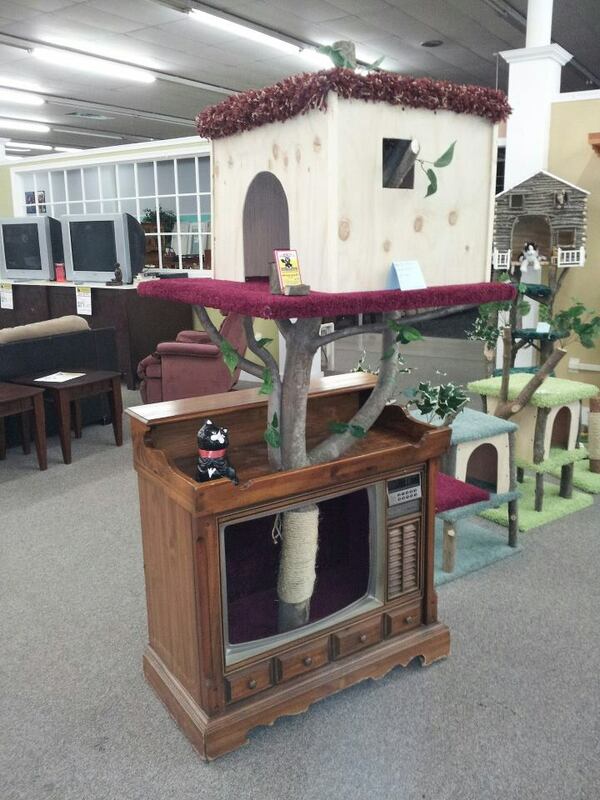 But maybe you could help them out by visiting their website and buying a custom-built tree house for your own kitty. Or, if you live in Stroudsburg, Pennsylvania, you could always visit their showroom and buy something directly from them. Hauspanther, an online magazine for “design-conscious cat people”, posted an article about a new German organization called Goldtatze. Goldtatze has joined the cat-house craze that Japan is well known for by building furniture that turns a human-centric home into a cat-centric home. With great walkways that hang from the ceiling to a central cat tree leading up to the walkways to beautiful, high window seats that are awesome for bird-watching, Goldtatze will soon become a cat-focused force to be reckoned with. Watch out Japan. Here comes Goldtatze! Have you heard of WebMD where you can go and check out what your symptoms may mean for your health? Did you know that there’s a WebMD for cats? It’s called the PetMD Symptom Checker. It can help you determine if you should take kitty in to the veterinary immediately, or if kitty can wait for a scheduled appointment. But, as with any medical issue, when in doubt, ask your veterinarian. And always keep an eye on kitty; you know how we can be mildly OCD about things, and PetMD might just help us build up our hypochondriac tendencies. You can visit the PetMD Symptom Checker site here. There’s a new (ok, not so new – it was released in 2000) Pixar movie out called For the Birds, but I think this movie is really for the cats. It must be really good because other orange tabbies are truly focused on the greatness that is For the Birds. While it runs a bit long at 3 minutes and 26 seconds, it does seem to have the ability to capture and hold attention of us cats. You can see one cat’s review in the video below. Let us know what you think by leaving comments below. Are you ready for the playoffs? 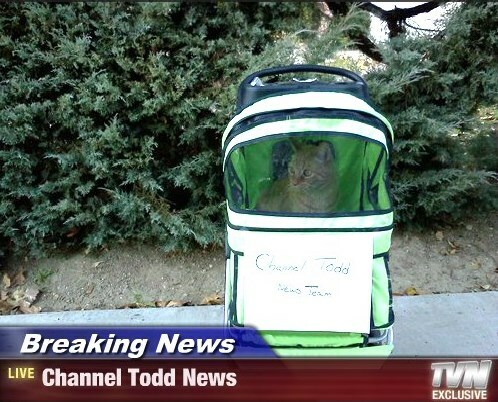 Based in California, we here at Channel Todd News are hoping the Kitten Bowl will be a big hit on Super Bowl Sunday. We’re rooting for the kittens to win this one. It’s about time, anyway, since Puppy Bowl has been around for a while. We’re aware that Puppy Bowl has since shared some time with kittens, but the Hallmark Channel will be focusing just on kittens this year. We applaud them. There’s a magazine out there called Mousebreath. We adore the magazine and hope we can get as popular as they are. 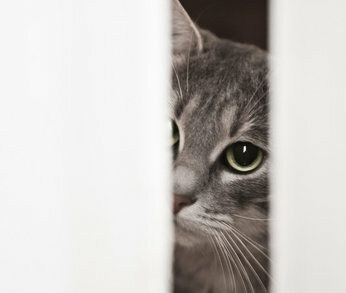 http://mousebreath.com/ They have great articles and provide a lot of information to us cats. It’s a magazine by cats for cats. Who can beat that? I’d love to be hired by them, but I don’t even know how to get started. I’m a fine reporter, but not a great writer. Hey, maybe they need a reporter? I guess I’ll head on over and find out. Ava Gardner, the cat, is celebrating her 12th birthday on February 22. To join in her celebration, you can visit her Facebook page here. From January 25th through February 2nd, there’s the (hopefully first annual) Cat Art Show in Los Angeles. We’re very excited about this and are looking forward to giving it rave reviews. For more information, visit the website here. For more information, visit their website here. It’s official!!! I can legally drive my stroller now! I’m not sure my height is correct, though. I think I’m taller than that. And what’s with the stupid picture? 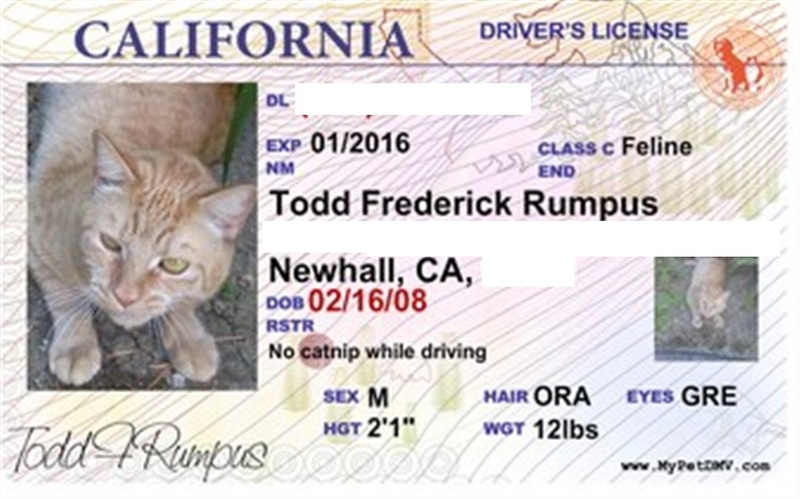 Why does every cat I know have a bad driver’s license picture? Whatever! I’m ready to go cruising around the neighborhood in my green stroller with my new driver’s license. Mom won’t hand over the keys, though. She says she still thinks of me as her little boy. Bah humbug!!! Cat Olympics – Results Now In! Ok, so this is some late breaking news, but we have the official winner for the cat yodeling competition in the cat Olympics. I loved watching the competition and must say that Zoe’s performance just blew me away! This is a great video done at Best Friends Animal Society in Los Angeles. 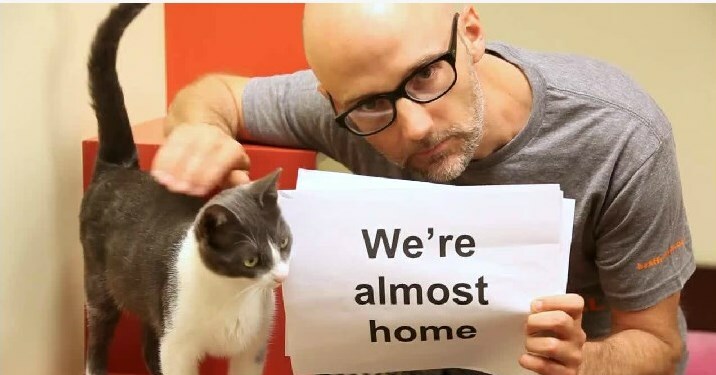 It’s done by Moby. Check it out. It has a lot of dogs in the video, but that’s ok, because he included kitties, too (some of which have been adopted already). See the Post on facebook by Best Friends Animal Society. Hey everyone. If you live in the San Francisco, Berkeley, Oakland, East Bay area and have some extra unused blankets or dog beds laying around, the Berkeley Humane Society on Ninth and Carleton could use them. Donations are tax deductable, too, so making end of the year donations can help not just homeless dogs and cats, but you, too! Also, there’s a dog rescue in L.A. that’s an all volunteer animal charity serving underserved communities like South East Los Angeles, Watts and Compton. They say, “We offer free services such as spay/neuter, vaccines and basic medical care for dog owners who want to keep their dogs out of a shelter.” Their name is Downtown Dog Rescue and they seem like they do some really good work. I’m not so big on the puppies, but they deserve homes, too, even if I don’t want one. There’s a lady my mom got to work with; her name’s Stefanie and Stefanie used to volunteer for Berkeley Humane Society (she might still volunteer there, I’m not sure). Stefanie recently got to go visit some really big kitties at Big Cat Rescue in Florida. 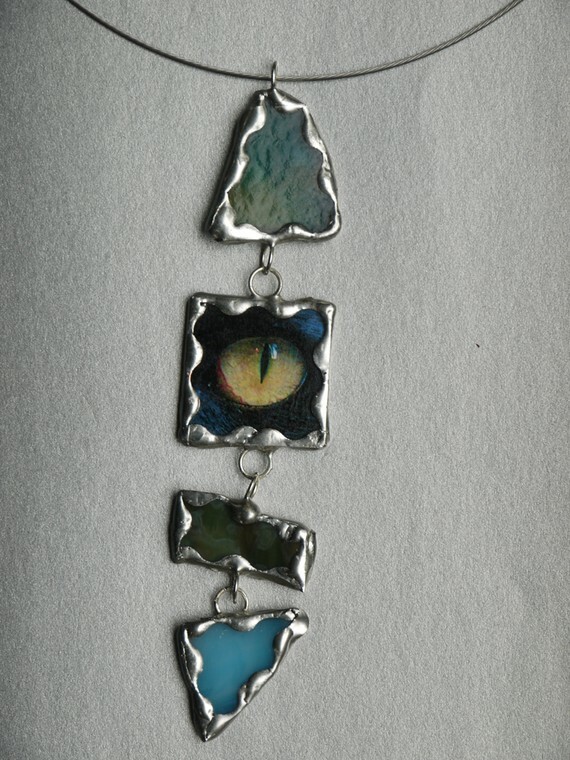 Every now and then, mom goes to Stefanie’s etsy page (which you can visit here). She found the pictured choker that mom thinks is just fabulous. 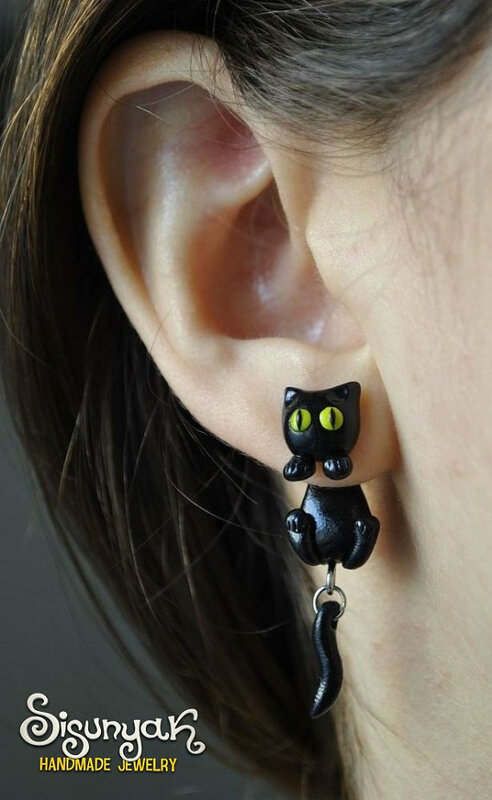 So I got to thinking that maybe, if you’re still Christmas shopping, I should post a few good ideas for gifts for those cat lovers in your home. So, of course, the first one is the choker by Stefanie. Click on the links under the pictures and you’ll go directly to the website mom found the item on. Just keep in mind that mom’s looking at small businesses that may only produce one of each item, so if it’s been sold already, keep looking and maybe you’ll find something else worthwhile. What do you mean I haven’t posted all day? Boy am I getting slack on my job, or what? I guess I’ve just been a busy man. Those naps sure are time consuming! And watching birds and crickets and lizards through the living room window is a tough job, but I guess someone has to do it! A good friend of mine brought a rescue group in Hawaii to my attention. Boy, now I sure do want to visit after watching the videos on their website (which are posted below). The rescue’s called Lanai Animal Rescue Center. I would love to visit there someday. But, mind you, that’s only visit. I think all the kitties there should get a home because homes are much better than living in a rescue or shelter, no matter how fabulous that rescue looks. My blog has been getting views from all around the world. That makes me very excited and happy. So, I’d just like to say Thank You and Welcome to the people in the following countries that have visited this site so far! 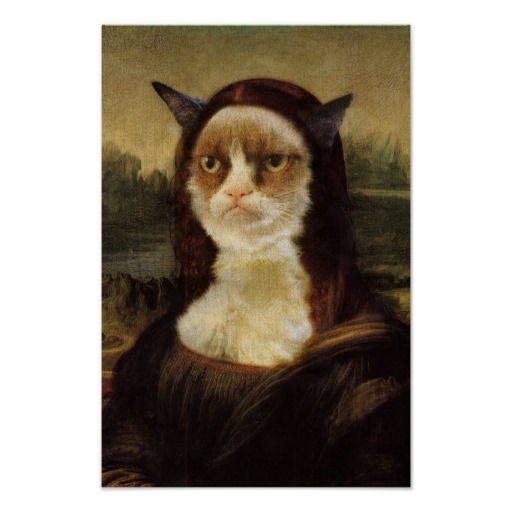 Here’s the last part of my installment for travelling with cats …. or, in this case, without cats. Sometimes you humans can’t take us cats with you. Sometimes, us cats don’t want to or can’t go. That means leaving us behind. When you can’t take us with you for whatever reason, you have a few options. First, there’s boarding facilities. 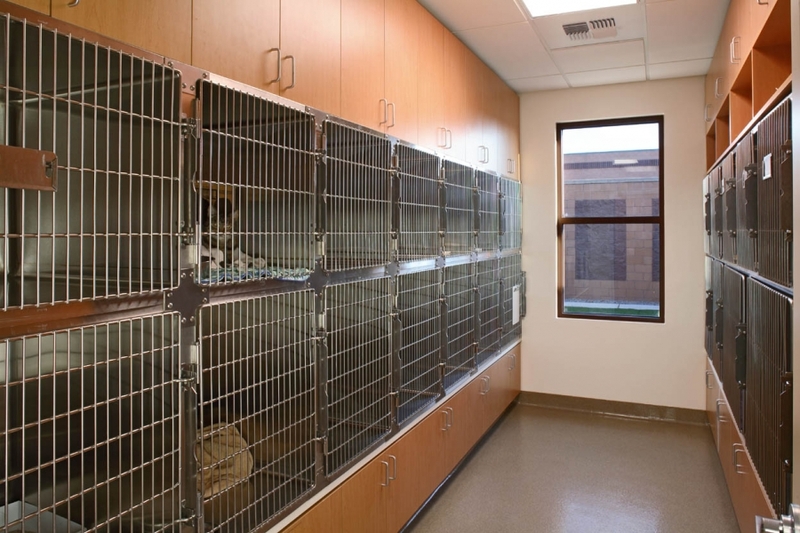 You can find all sorts of different kind of boarding facilities from those that use cages, those that don’t use cages, those that house both dogs and cats, and those at Veterinary Hospitals. The good part about using a veterinary hospital is that if we should get sick, they’re more likely to spot it sooner and react quicker. 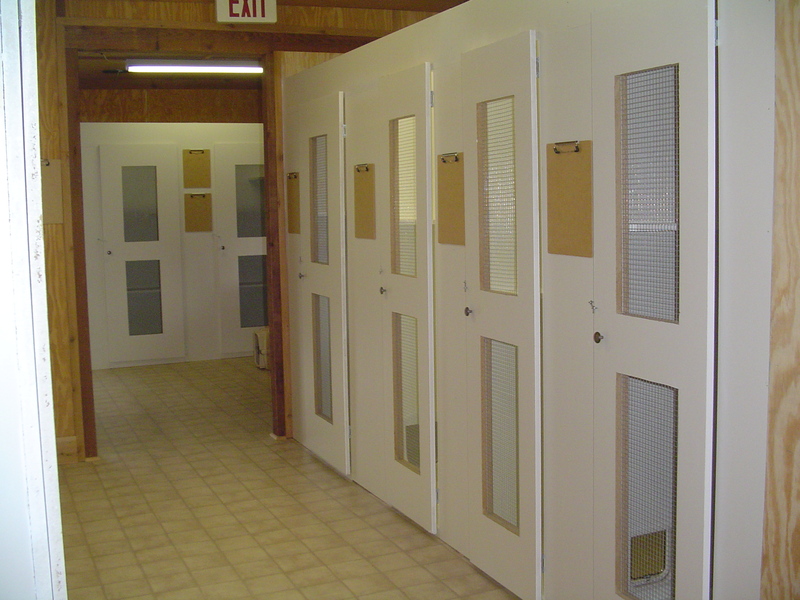 The down side is that Veterinary Hospitals tend to be short on space, short on time, and tend to use cages. What’s wrong with cages, you ask? Just think of what it would be like for you to go to jail for the holidays. Not exactly you’re idea of a merry time!!! However, not all Veterinary Hospitals use cages, and there are more of them trying to make cat boarding as comfortable as possible for us cats. The Purr-fect Hotel at the Highland Veterinary Hospital in Highland, MD is a great example of a hospital that has some great space for boarding cats. I’d be pretty comfy there! Additionally, for some interesting, strange, unidentifiable reason, most boarding facilities that use cages tend to have the cages facing each other (Veterinary Hospitals are typically the exception to this rule, but not always). So, what’s wrong with this, you ask? Well, I’m a social guy; I like other kitties. But if there’s a cat on the other side of the room staring me down because he hates other cats, it doesn’t exactly make my stay very comfortable. In fact, it stresses me out big time. And for that cat who doesn’t like other cats, being at a boarding facility that uses cages will be incredibly miserable for him, incredibly stressful, and make him more susceptible to illness (travel, which stresses us out, will always make us more susceptible to illness, but we’re talking about the difference between possibly getting a little cough to coming down with a full-blown cold). 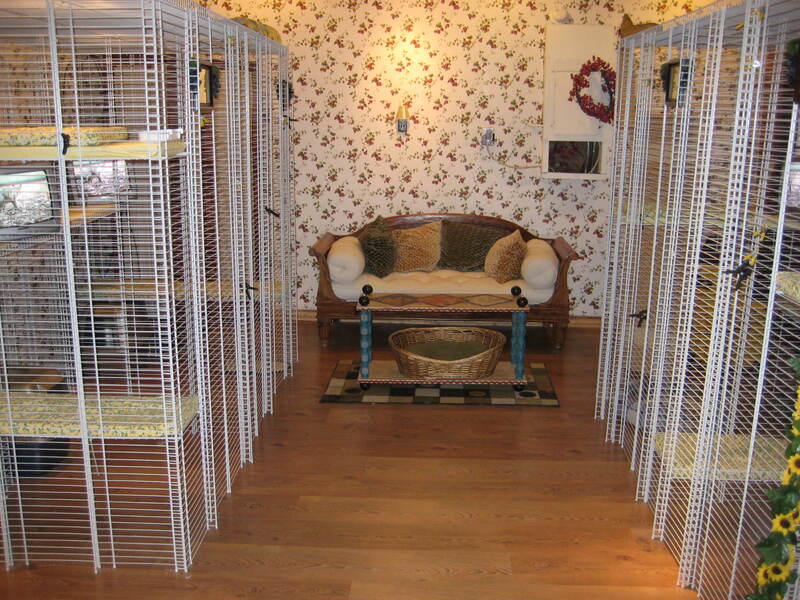 So, in your search for boarding facilities, try not to choose one that has cages … and try not to pick that one that says it houses cats in cages in a cozy laundry room (I kid you not!). You may pay a little bit more for a cageless boarding facility, but generally the difference in cost is minor. So what else should you look for? Try to stay away from boarding facilities that house both dogs and cats. 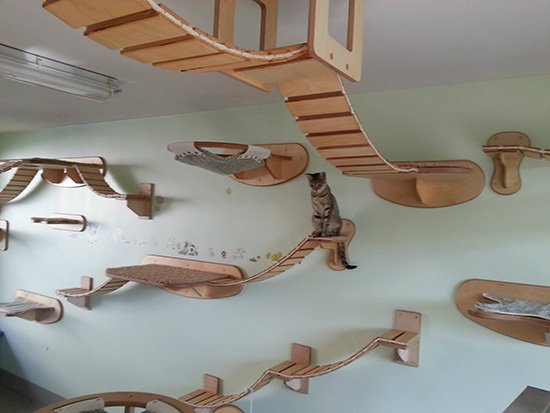 There are cat-only boarding facilities out there. But if you can’t find one near you, try to choose a facility where the dog noise is comfortably muffled. Note: if there are dogs housed at the boarding facility, you won’t be able to get away from dog noise. Also ask to go on a tour of the facility. If they won’t let you, don’t board your cat there. And if there is more than a minimal smell of litter or food (similar to what you’d smell at home), don’t use that facility, either (do keep in mind that if they’ve just cleaned, which is typically done during the morning hours, there may be a stronger odor than if they’d cleaned hours ago). Also ask what veterinarian they use (if you’re not boarding at a Veterinary Hospital). If they don’t freely give you that information, go away. Also, if they don’t allow you to bring bedding, toys and food from home, they probably don’t understand how to make a cat as comfortable as possible (would you want to go somewhere that you weren’t allowed to bring your own clothes and had to wear someone else’s?). 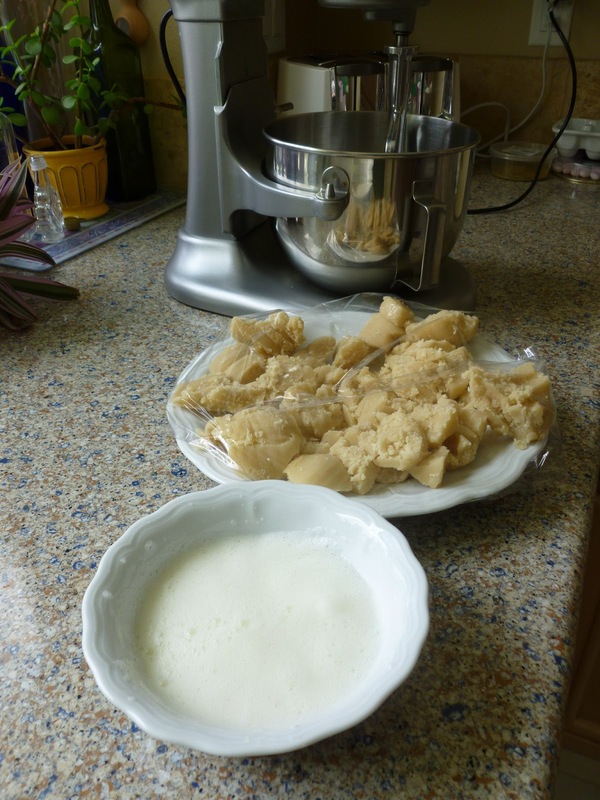 And do be sure to bring some comforts from home; it makes us feel a lot better! 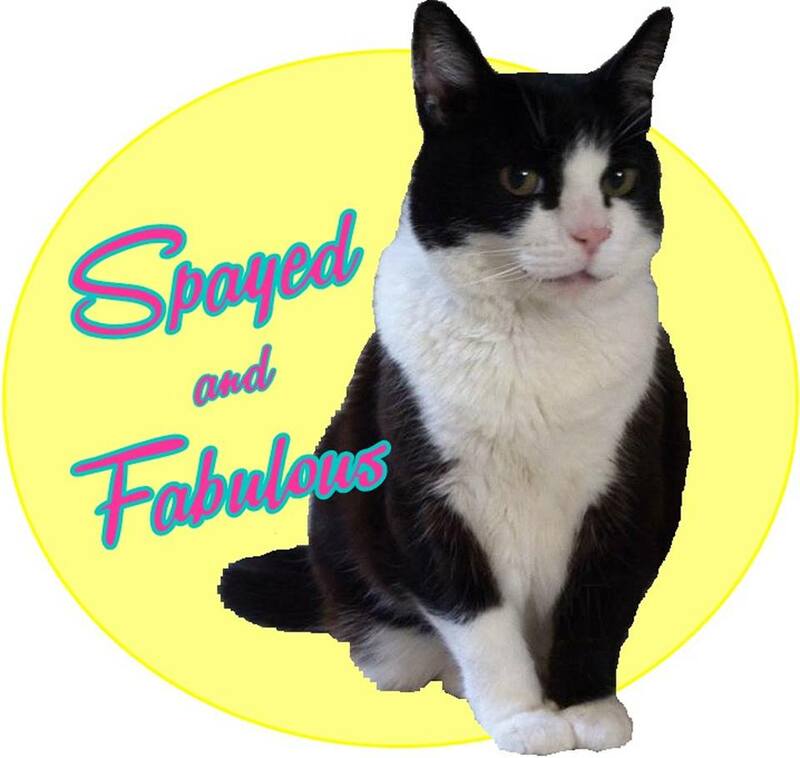 Know that most, if not all, boarding facilities require that your cat is current on vaccines. If your vet has recommended not giving anymore vaccines (which can happen, especially if the cat is older), talk with them about doing so for boarding purposes or if there are any other alternatives. 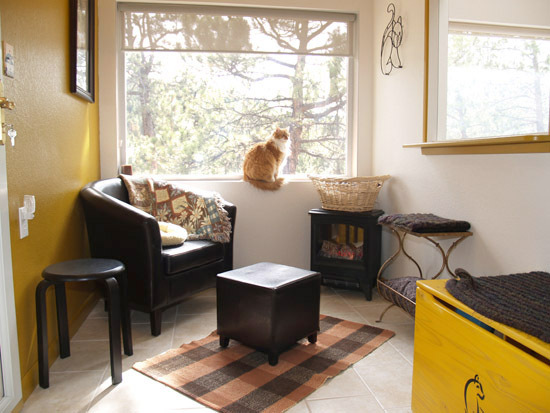 A really good example of a cat boarding facility is called Evergreen Cat Lodge in Evergreen, CO. You can house up to 3 cats in one suite for no extra charge (a lot of places do charge extra for more than one cat). The rooms look like little homes. And they don’t charge for little add-on services like nail clippings, administering medications, and ATTENTION!!! The only extra service charges, which is optional, that they appear to have are webcams that you can gain access to for $5 per day. And, let’s face it, that’s a really minimal charge for the pleasure of watching your cats nap all day!!! There’s also the Cat Taxi in the off-chance you can’t bring us yourself. The price of the cat taxi is similar to how an actual taxi works (they charge by mile with a $20 minimum charge). 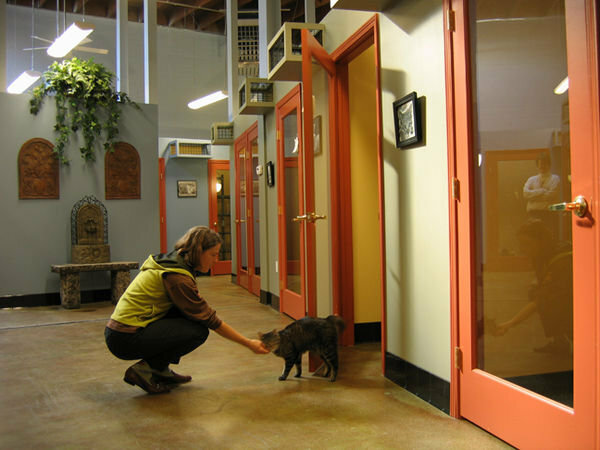 Some other good examples of cat boarding facilities are Feline Wishes and Caviar Dreams in San Francisco, CA and Camp Kitty in Scottsdale, GA. Please be aware that I’ve never been to a boarding facility, so I am not advertising for nor vouching for any of these places. I’m calling them good solely from what information I find online. It’s up to you to choose what you’re comfortable with. 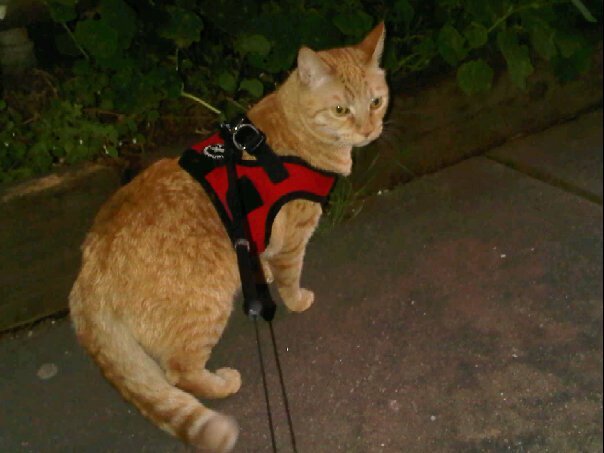 However, in most cases, when you have to leave your kitty behind, using a pet sitter is typically the best option. We’ll be at home where we can hide in our usual spots, smell the usual smells, and not have to worry about going anywhere. How do you find a petsitter? First, find one who specializes in cats. It doesn’t have to be a cat-only pet sitter, but s/he should know cats well, appear comfortable around your cats, and have some good knowledge of cat behavior. 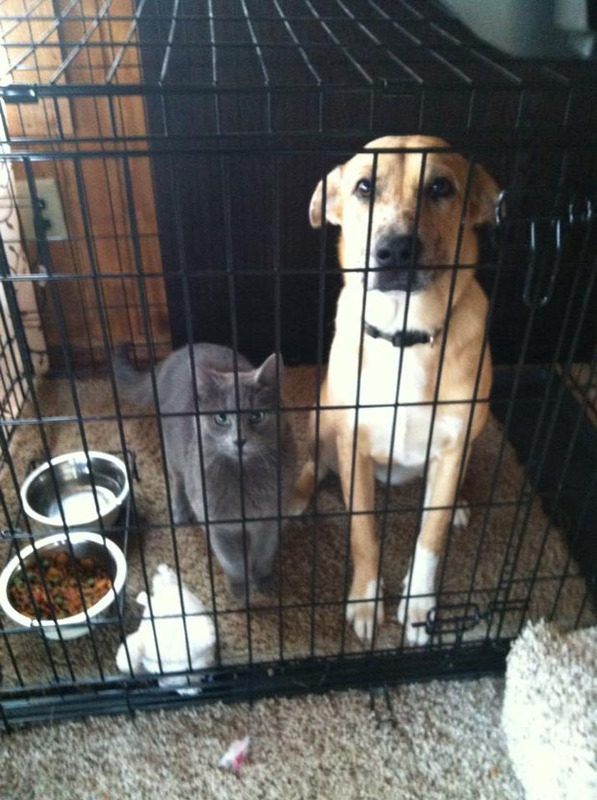 Some pet sitters are insured, some are not. Which do you choose? Well, pet sitters that are insured are typically insured to cover mishaps, such as damage to the home (whether the sitter is in the home at the time or not) and sudden illnesses of your cats. What does this mean for you? A pet sitter who’s insured is covered during mishaps while an uninsured pet sitter must pay for mishaps out of their own pocket (and aren’t protected in case the client – you – decides to sue for a mishap). It’s up to you whether you choose an insured or uninsured pet sitter. In most cases, it doesn’t make much of a difference. How do you get recommendations for pet sitters? You can ask your veterinarian, employees of an animal shelter, friends who have cats, or you can do a search online, like through Yelp or Craigslist. Make sure that you’re comfortable with whoever you choose … you are entrusting them with the keys to your home and your cats. Ask questions that are important to you. Maybe you want to know what kind of experience they have with cats, if they’ve ever medicated a cat, if they know how to work with shy cats, what to look for in sick cats, etc. So, remember that we cats generally prefer to stay at home. Not an actual boarding facility photo.